The Georgia State men's basketball team advances to its second consecutive NCAA Tournament after winning the Sun Belt Conference Championship against Texas Arlington. For the second consecutive year, the Georgia State Panthers are heading to the NCAA Tournament. 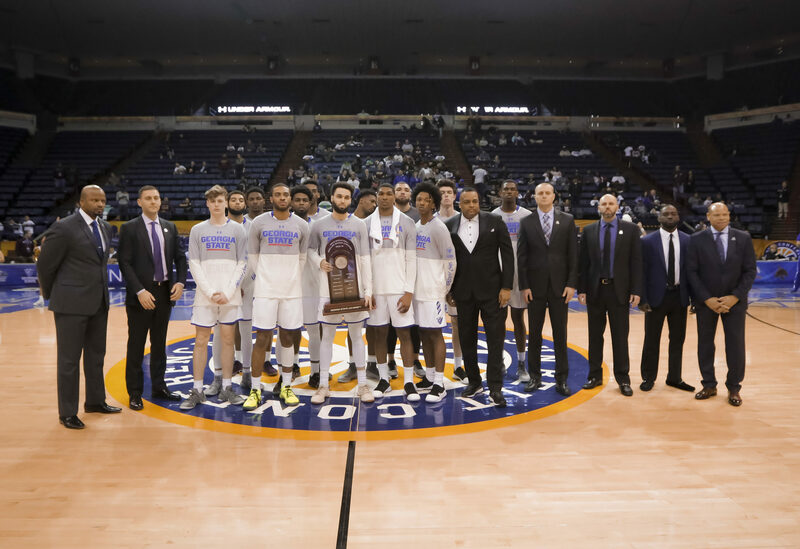 Fans and players are rejoicing after the Panthers clinched the Sun Belt Conference Championship title with a 73-64 win over Texas Arlington on Sunday, sending them to the big dance. The Panthers lead 36-31 going into halftime with plenty of momentum. As the second half began, the Panthers opened up with a quick 4-0 run, led by guards Damon Wilson and D’Marcus Simonds. This increased their lead to nine, and the Mavericks called a timeout. With 15:41 to go in the second half, senior Jeff Thomas made a 3-pointer, giving Georgia State a 12-point lead, its biggest lead of the game. The Mavericks kept things close, but the Panthers pulled away. Malik Benlevi, after being fouled late, drained two free-throws, and Georgia State head coach Ron Hunter subbed out all the starters. Georgia State defeated Texas Arlington in the Sun Belt tournament championship game for the second consecutive year. Benlevi led all scorers with 16 points, and logged his third straight double-double with his 11 rebounds. Wilson finished with 13 points, Kane Williams with 12, Thomas with 11 and Simonds with 10. The Panthers find out their NCAA Tournament opponent tonight on the Selection Sunday show on CBS at 6 p.m.